Keyword Analysis – Keyword Analysis, in simple terms, is market research. It tells you what people are interested in, and in what relative numbers so this gives you an estimate on how many searches are made for your target Keywords. Keyword Analysis also provides the actual language people are using when they conduct a search. Keyword Analysis is one of the most important and valuable activities that can be performed in the SEO (Search Engine Optimisation) field. Ranking for suitable keywords can make or break your website, Coffee Black SEO can provide simple but effective Keyword Analysis that informs you on what Keywords should be used throughout your entire website. We research and carry out Keyword Analysis in order for us to gain a better understanding of your market’s keyword demand, you not only learn which terms and phrases to target with SEO, but also learn more about your customers as a whole and what it is that they want. Getting visitors to your website is good however, SEO (Search Engine Optimisation) is all about getting the right kind of visitors to your website. We at Coffee Black SEO realise that targeting for key phrases is an important part of any website and it’s SEO efforts, we perform effective Keyword Analysis to establish what it is that you should be targeting in order to produce new sales or targets. A keyword is basically any word or phrase that you enter into a search engine such as Google. In a nutshell, your keywords are the words and phrases you want to rank for in search engines. If you’re an SEO Company based in the UK some of your important keywords may be “SEO” and “SEO Company UK” for example. Your keywords are the phrases that you want people to search for and then notice your website and come directly to your website from the search engine. It is important to know and research about the keywords and key phrases that are being used the most by the target audience (regarding your businesses niche) to search when using search engines such as Google. Keyword Analysis is the key for a successful SEO (Search Engine Optimisation) campaign. Keyword Analysis helps to achieve what keywords or phrases should be targeted. Keyword selection is a vital process in SEO (Search Engine Optimisation) campaigns because it works to deliver genuine prospects and potential customers that are interested in your products or services. The Keyword Analysis and selection process is built to identify and target all relevant keywords that are suitable for you and your business, Coffee Black SEO focus strictly on getting the most relevant users to your website and we also help to get targeted users to a specific webpage that has been found on page 1 of Google from a search that they conducted. Most people will have reached this stage on their own. You can get basic keyword information by using a tool such as https://adwords.google.com/o/KeywordTool this will then provide you with a list of related terms based on your initial search. An example for an electrician is below. This data provides some initial information about what terms people are searching for each month and a very high overview of the competition on a scale of 0 to 1. This is actually where most people will stop and utilise the data to make choices on what keywords they should be targeting. Coffee Black take this several steps further to ensure we are targeting keywords in a much more qualified fashion. We pay for access to some professional level keyword research tools online such as www.semrush.com , www.keywordspy.com , www.seomoz.com and several other smaller niche research sites so that the level of information we end up with is not just a single set of data from Google but a qualified set of data from multiple sources. We often find results up to around 1500 – 2000 relevant keywords at this point. One of the main metrics which can be found from keyword research, when done well, is how much real competition there is for a keyword. At this stage we have some basic statistics from Google and other sources on how much traffic there is for a specific term and a vague competition value from Google. There are several ways we can expand this data set by making searches within Google using what are known as modifiers. Allinanchor: this provides results in Google where the page shown has a link pointing to it with the keyword in question in the link. So for a sample we will look at the keywords “Electrician” and “residential electrician” in Google using these modifiers to gather additional information about each term. This gives us a lot more information about what the competition really is for a keyword. 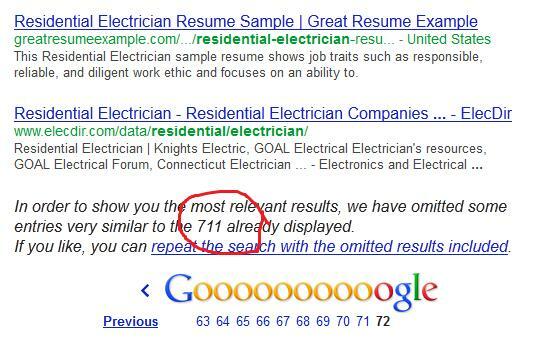 There are over 33 million results for the term but only 2,840,000 of those pages contain the word electrician in the title of the page and a similar amount within the url of the page also. We can see now that the results for this are very different in some cases. Now you can see that there is a very large difference between how many results show within the Google index 17,700,000 and how many pages are actually using basic optimisation for their pages for that term (Title is optimised = 17,800, Url is optimised = 9360) Titles and URL’s are the basics of On Site optimisation and would be expected to have been completed for any serious website as far as SEO is concerned. We can also take this a step further because of the fact there are two words within this phrase we can make Google do an exact match search only by adding quotation marks around the phrase. As you can see the competition given by Google for any specific keyword just by looking at the results for the keyword on its own is never a very clear indicator of competition. Only by delving deeper for each term would you find the real competition and therefore the value of optimising for a specific keyword or phrase. Google now provides us with the final metric that we would look for which is how many results it considers are real results without any duplicates. If we add this to our previous findings for this keyword we can move onto the next stage of calculating the value of the keyword based on search amounts. There are several ways which these calculations are made and many different metrics which can be used to do them. We have two internal calculations which we provide meaningful values based on what we believe is the true return on investment for each keyword. Now with these values as a calculation it would appear that the term electrician would actually provide better returns on investment for SEO purposes. However because we have all of the additional information about each keyphrase we can go a step further and calculate based on true competition values of websites who have actually got an optimised Title and url. to explain the above equation in plain English we take an average of the Allintitle with Quotes search and the Allinurl with quotes searches and use that as our competition figure. We believe this is a more accurate indicator as these are websites which have actually been optimised for the term in some way. This shows how the values and suggestions of keywords changes as we find out more information about them. In reality the calculations we make are actually more complex as our calculation progresses with ever increasing inputs and ways to gather different metrics and competition data. The calculation also evolves as we take into account changes by Google on what it thinks are relevant factors in rankings at the moment. The end goal is that our Keyword Effectiveness values are as accurate and indicative of real competition as they can be and can be used to drive the right traffic to the site while knowing which keywords should be quick wins versus long term goals. This process involves collecting information about your competition and what they appear to be targeting. Coffee Black SEO have Keyword Analysis tools that will help you to identify how many pages are indexed in major search engines for your keywords. To make this complex task easier for you, we can create spreadsheets so that you can compare the different search terms that you have and disregard all of the junk terms that aren’t relevant to your website and that don’t provide enough traffic to your website. After we have performed the above topics. we then need to decide on what keywords should be selected in order to gain maximum exposure to your website. Even though people usually use generic search terms, a high ranking on such key phrases has been found to return mediocre traffic. Focused keywords will give your site better rankings plus highly targeted web traffic, this traffic can be tailored to specific target audiences which further increase the chance of sales. When narrowing down a selection of search terms, Coffee Black SEO consider your site’s PageRank and keywords’ competitiveness. We can then offer you a solution to gain a healthier exposure on Google and any other Search Engine that you require.